The Trump Administration plans to open the Atlantic, Pacific, Eastern Gulf and the Arctic to new offshore oil drilling. Time and time again, the practice has proven to be dirty and destructive. It harms our ocean and coastal communities and it destroys the ocean. Even without a spill, new drilling will include deafening seismic blasts during exploration, which could harm or kill whales and dolphins, as well as other marine life. Our leaders need to hear your position on offshore drilling. This message takes less than 3 minutes to fill out and will send a message to Governor Cuomo and elected officials. Surfrider is collectively asking the Administration and Congress to protect the Atlantic, Pacific, Eastern Gulf of Mexico, and Arctic Ocean from offshore drilling. Please show your support. The Bureau of Ocean Energy Management looks after the U.S. Outer Continental Shelf. It sets regulations on how energy and mineral resources can be used responsibly and economically. BOEM is expected to release a new draft proposal to the National Oil and Gas Leasing Program before spring 2019, followed by a very important comment period. On Nov. 16th 2018, Husky Energy spilled an estimated 1572 barrels of oil into the Atlantic coast of Cananda/Newfoundland. Rough weather conditions initially prevented the clean-up, which has now been deemed impossible. Read more about the Husky oil spill here. Additionally, a recent study has found that the 2004 Taylor oil spill may have leaked up to 1700 barrels of oil into the Gulf of Mexico EVERY DAY since it happened. That rivals Deepwater Horizon–the largest oil spill ever off US coasts. 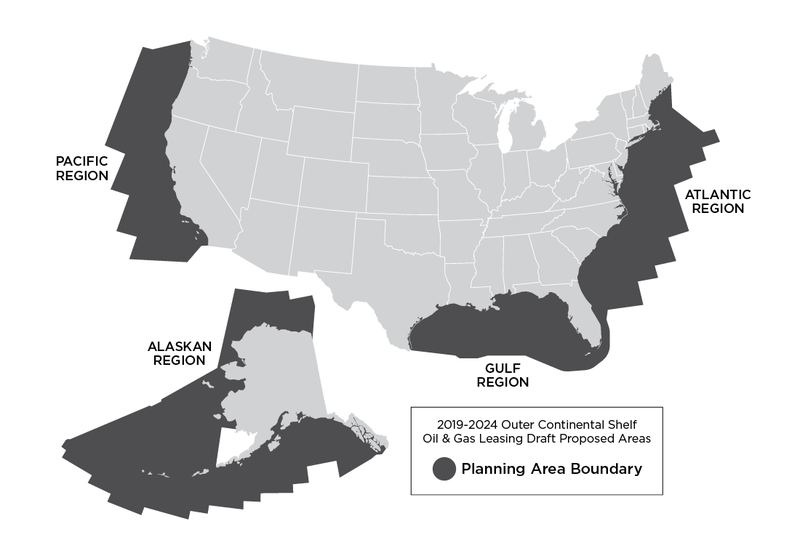 Despite these recent and ongoing catastrophes, the US federal agency Bureau of Ocean Energy Management still proposes opening up to ~90% of US coastline to new oil and gas exploration. Surfrider Foundation is determined to prevent this plan from being finalized, but we need your help. It’s time to make your voice heard. Please join us by submitting comments to BOEM and contacting your federal representatives. We also urge those in affected communities to attend an upcoming public hearing to provide testimony against new offshore drilling in our oceans!